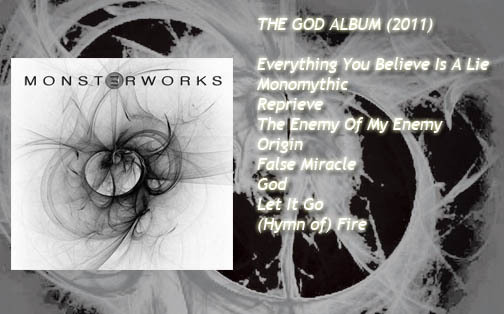 Recorded in April 2009 at Earth Terminal Studios with Lewis Childs engineering; The God Album introduces a more organic sound for the band sending the listener into philosophical territory. The irony of the title is that the album is not about a singular deity at all; it is a considered critique of the most dangerous social force of our time: organised religion. The album was initially recorded as a three-piece when still considering what to do about a new guitarist to replace Ian. The choice turned out to be fairly obvious as Hugo and Jon were already playing in a London band called “Dog” with Dimebag disciple: Marcus. He shredded; he was in. Marcus’ lead and rhythm guitars were written and recorded over the existing tracks prior to and during mixing at Earth Terminal. Nothing like leaving things to the last minute. It is the Monsterworks way. Companion lyrics/philosophy is HERE.